In 2015 Susan Coates and her family returned home from Alberta to Turk’s Cove. Soon after her arrival her job search commenced; however, her dream of becoming an entrepreneur kept tugging at her heart strings. Being proud of her Newfoundland and Labrador culture, her vision of opening a giftware/café went into motion, she started researching suppliers, markets and funding options. Susan approached CBDC Trinity Conception for assistance through the Self-Employment Assistance program and through discussions with her Business Development Officer, a start-up youth loan was also approved. In April 2016 her dream was realized. 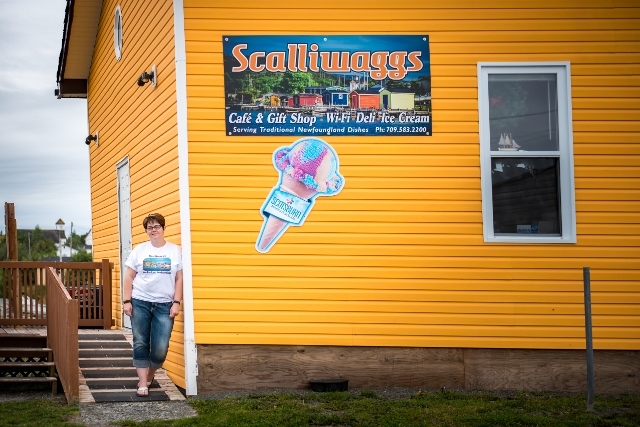 Nestled in the quaint outport community of New Perlican, coupled with the picturesque scenery of the ocean, colored stages and Jelly Bean Row building, Scalliwaggs takes on a new meaning of Newfoundland/Labrador experience. The café includes souvenirs, giftware and homemade food and, together with Susan’s hospitality and service, makes it second to none by all who visit. In March 2017 Scalliwaggs expanded its services by providing a school Lunch menu to the local elementary school in Winterton. Business has exceeded her projections and although it involves long hours and lots of sweat equity, Susan is very proud of her accomplishment. CBDC Trinity Conception congratulates Susan on the success of her business over the past 18 months and will continue working with her in the future.